As the summer comes to an end and we enter winter it's good news for the island's almond trees. Throughout January and February each year the island bursts into bloom with beautiful almond blossom, the trees engulfed in whites and pinks and the air filling with their delicate aroma. As well as the traditional olives, almonds are a large part of the culture in Majorca, with millions of trees growing across the island. 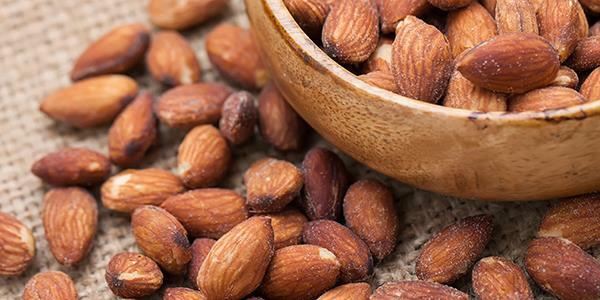 Both are a large part of the diet for the islanders and almonds are used in traditional recipes like almond cake, almond ice-cream, turrón (a type of nougat), or simply toasted, salted or candied as snacks. The main areas for almond production are centrally, around Marratxí, and to the west close to the municipality of Bunyola; here the trees grow in particularly high concentration, and provide excellent photo opportunities. Marratxí is only around half an hour from Biniorella and easy enough to get to by road. If you'd prefer to explore by foot there is a nice walk close to Biniorella that will take you from the nearby town of Peguera to Es Capdellà on a journey that will last a couple of hours. Alternatively the hills around S'Arracó, to the north of Biniorella, make for a wonderful walking destination at this time of year. Biniorella provides weekly walking tours for guests and during January and February these will incorporate the best areas for almond blossom, so you're sure to enjoy a beautiful route. There will be information for these at reception. 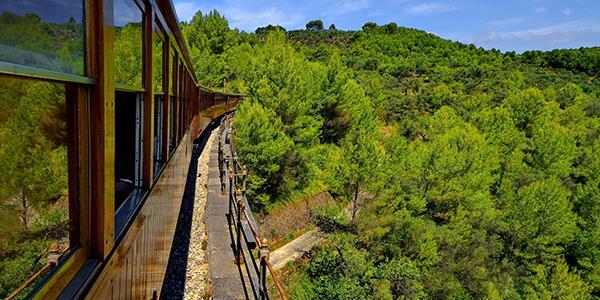 If walking is not your thing but you're still eager to see the blossom at its best, you can hop aboard the Palmer to Sóller vintage railway. This is a fantastic thing to do at any time of the year (though be aware there is a down period for a short time in the winter, and in January it stops completely before reopening for February). Built in 1912, the train's vintage carriages with their elegant mahogany panels are still in use today. The pretty route, between the coastal city Palmer and the town of Sóller to the north, takes passengers across country through views of pine forests, olive groves and orchards. When the season is right you'll get to see the lovely almond blossom too. 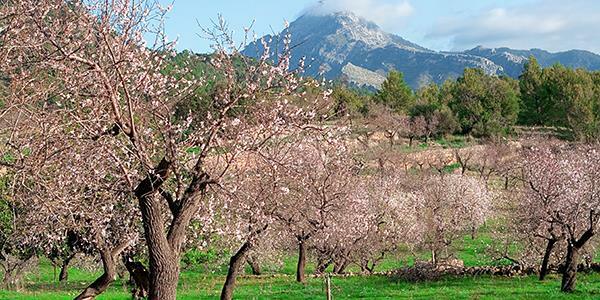 Almond trees have been part of the Majorcan landscape since their introduction in ancient times from their native Middle East. There are fiestas and fairs across the island and throughout the year dedicated to the produce grown here. The almonds, which are harvested in the summer, often using the traditional method of poles and nets, are plentiful on the various stalls and markets that you'll come across in the towns and villages. The almond tree is the first of the deciduous trees to flower, being particularly sensitive to the temperature increase, and the island is so popular for the blossom that special trips are organised from other countries, for the sole purpose of seeing the almonds bloom. If you're holidaying at Biniorella you are already in the perfect location to explore!